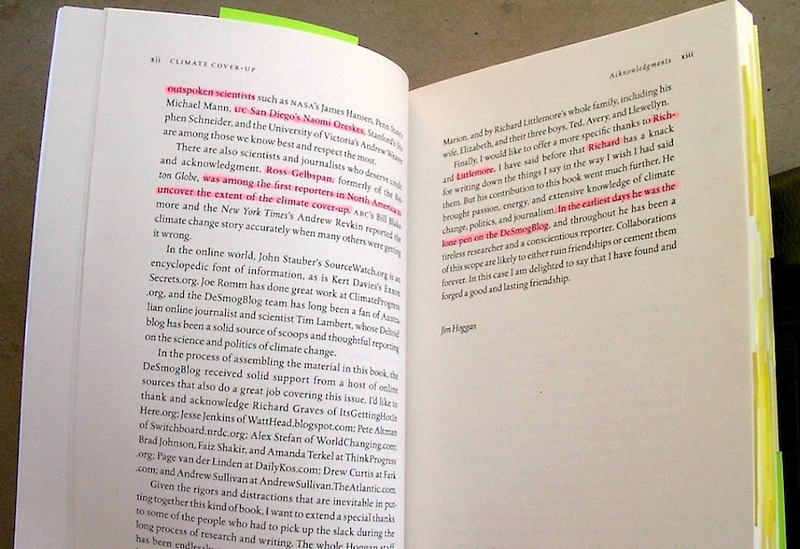 “Climate Cover-Up” book author James Hoggan offers a bold pair of statements on pages 164 and 230, “If someone tells you to be skeptical, be skeptical of them. For that matter, be skeptical of me,” and “… survey a variety of sources just to help confirm – or challenge – what you have read in this book. I am confident that it will stand up to scrutiny…” However, such bravado is odd, since he makes three different errors no later than three pages after his table of contents. Naomi Oreskes is a history professor not a scientist; Ross Gelbspan, as I’ve already established, was certainly not the first to ‘expose’ material that would prompt the public to think skeptics are paid industry shills; and Richard Littlemore could hardly be defined as a ‘lone pen’ at Desmogblog considering his blog posts started only two days before Gelbspan’s pieces began. 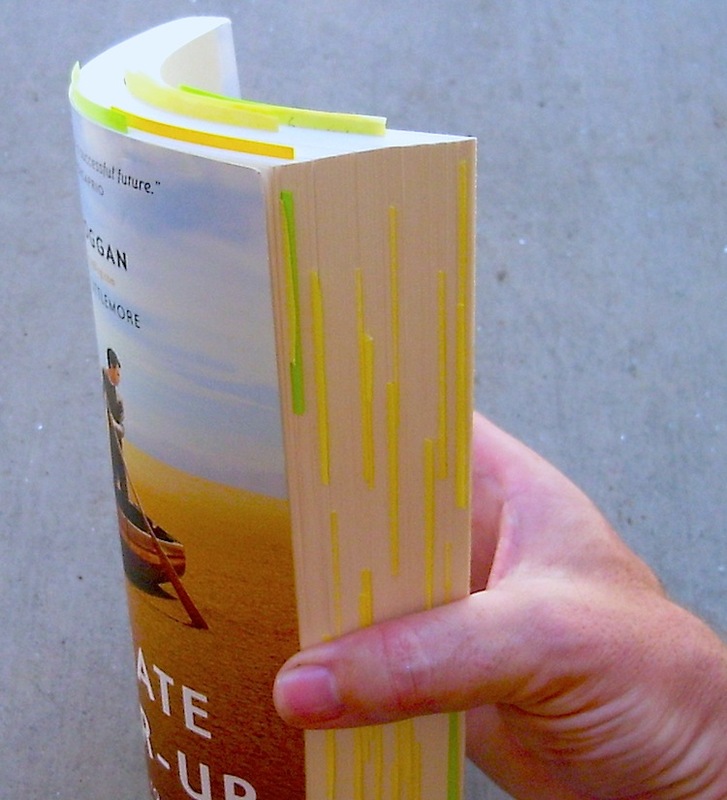 Actually, I can say after an initial too-fast read through Hoggan’s book, jotting down errors I found on yellow sticky notes, that his book is full of errors. I added a few more on new green sticky notes, while assembling this blog post. But let’s examine only one, Hoggan’s rather larger and inexplicable error of assumption….. and the detrimental way this error gets repeated. 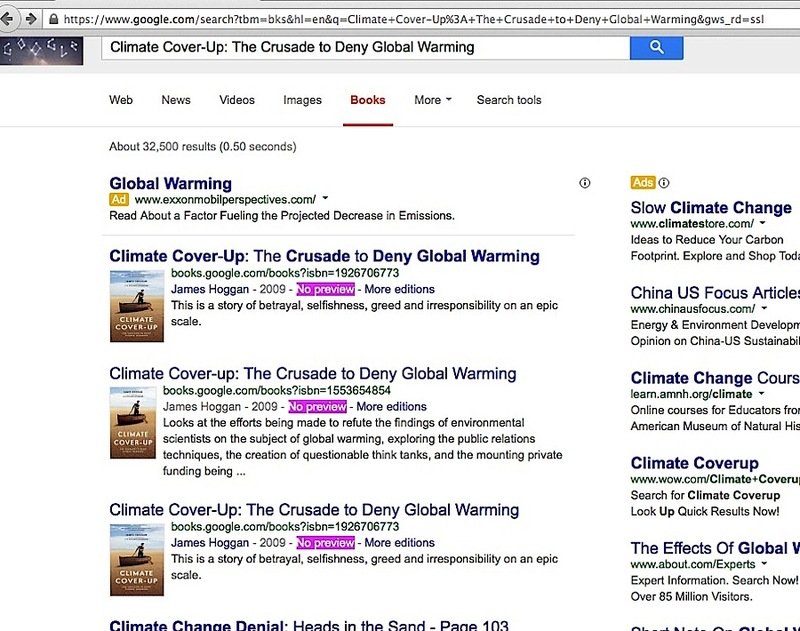 Similar to other like-minded material, “Climate Cover-Up” breaks no new or independent ground to prove skeptic climate scientists are paid industry shills. 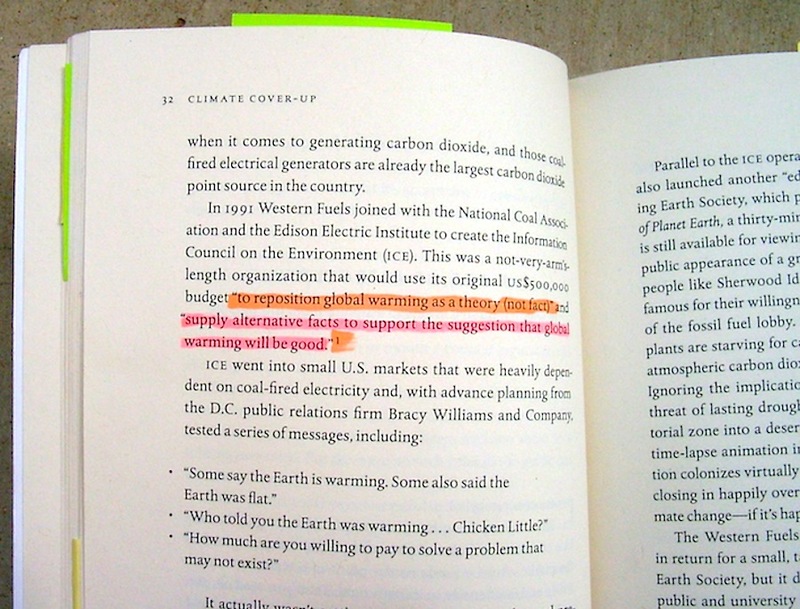 It merely repeats the same old insinuation about an industry directive to “reposition global warming as theory rather than fact”, stemming from Ross Gelbspan’s 1997 book. In this case, when Hoggan cites his source for that phrase, it leads readers to an odd cascade back to the original source. 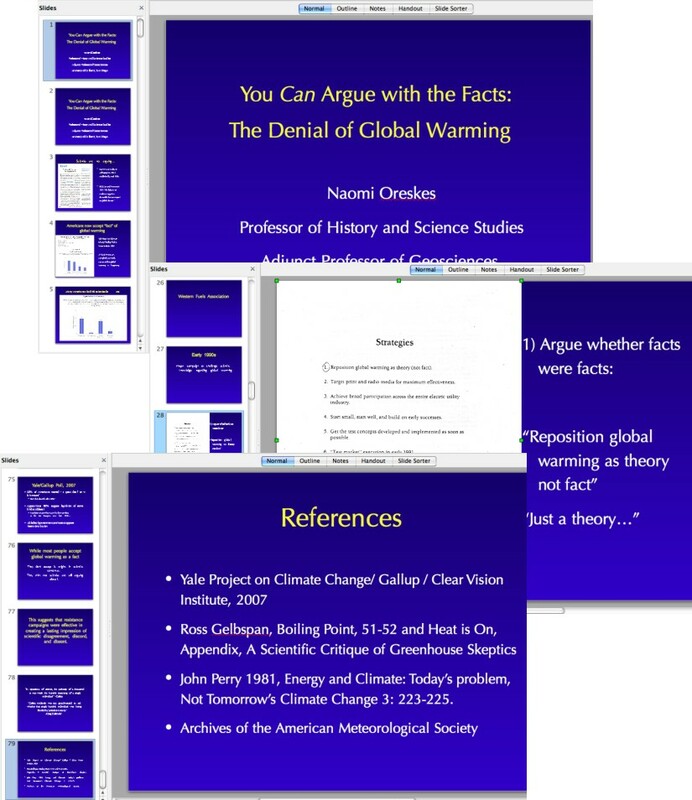 As I pointed out nearly a year ago in my August 30, 2013 blog post, Hoggan cites Naomi Oreskes’ 2008 slide presentation, Oreskes cites Gelbspan’s 2004 “Boiling Point” book, in which Gelbspan himself cites his 1997 “The Heat is On” book. What an odd thing to do, considering how Hoggan had so much familiarity with Gelbspan as his star blogger at Desmogblog from January 2006 to November 2010. He could have easily cited Gelbspan directly. 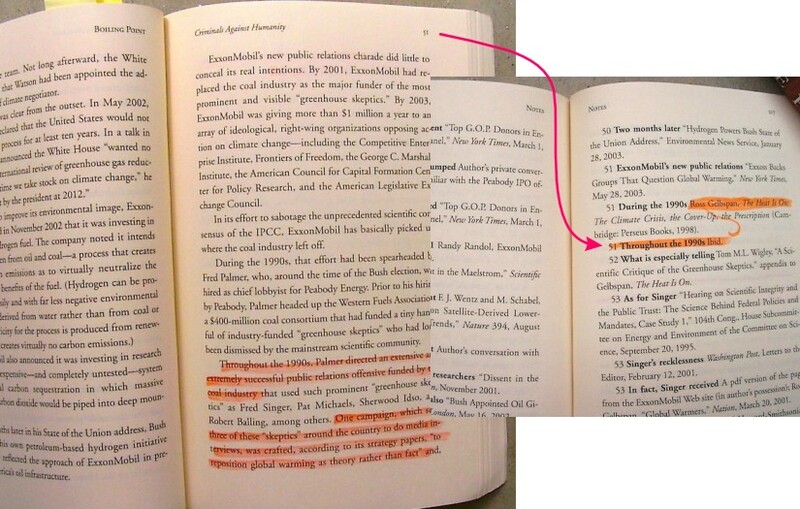 Hoggan’s citation cascade advances up one level afterward in Donald Brown’s 2012 “Climate Change Ethics: Navigating the Perfect Moral Storm” book, on page 98, where Brown cites “Climate Cover-Up”. 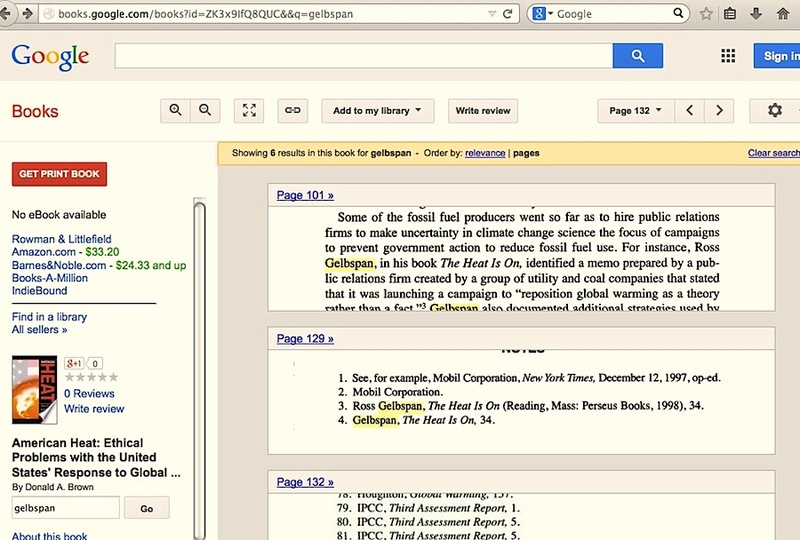 Funny thing is, Brown knew how to cite Gelbspan directly ten years earlier in his 2002 “American Heat” book. …supply alternative facts to support the suggestion that global warming will be good. From the way Hoggan places that phrase in quotes, there’s no mistaking how he intends it to mean it was a phrase from the leaked Western Fuels Association’s Information Council on the Environment (ICE) PR campaign of 1991. And he cites Naomi Oreskes as its source. 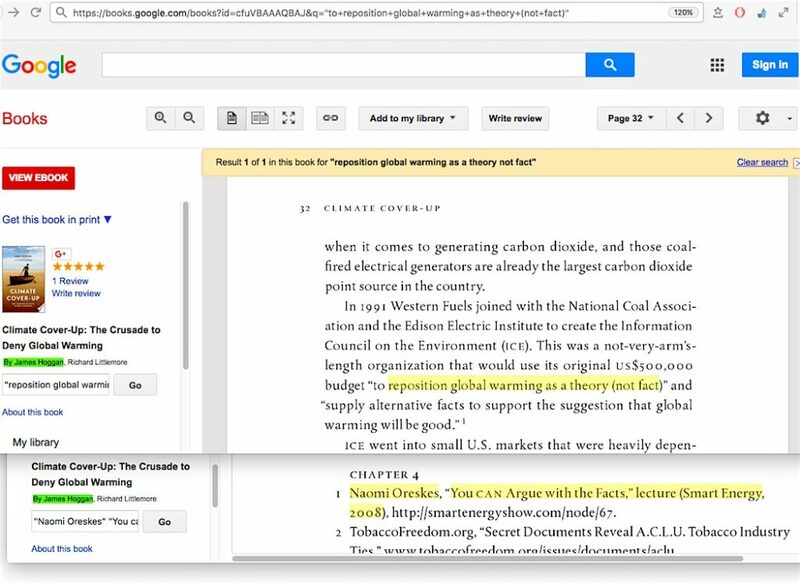 Problem is, while Oreskes cited Gelbspan as the source of the “reposition global warming” phrase, she made no such citation about the “supply alternative facts” phrase. No version of that phrase is found anywhere in the ICE memos in the incomplete scan set at Greenpeace archives. Where does Hoggan’s error come from? 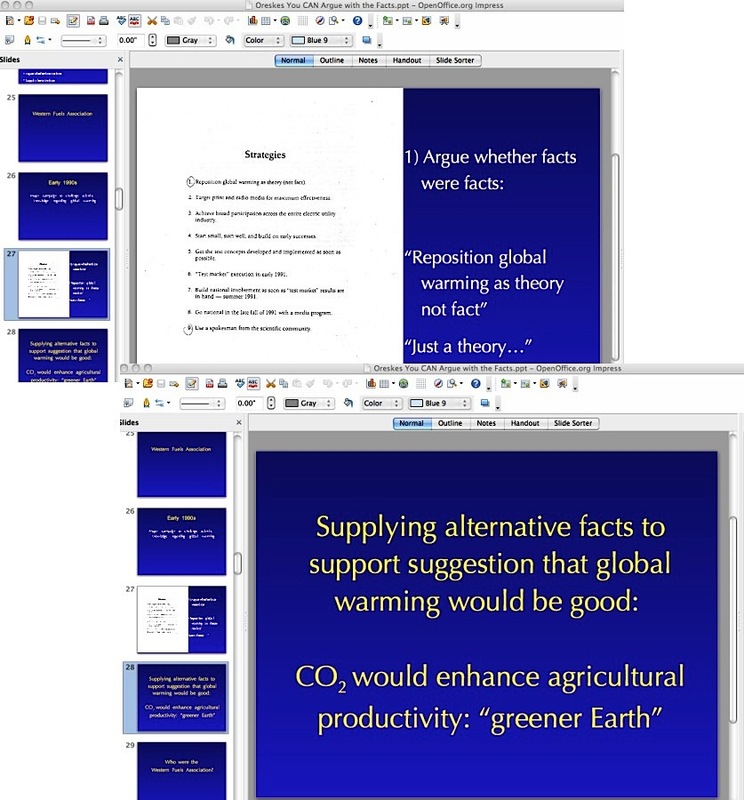 It is little more than a misinterpretation of Oreskes’ 28th PowerPoint slide, in which she did not quote anything from the ICE memos, she instead was apparently using her own words to insinuate that industry officials were orchestrating a sinister swap of established facts for their own propaganda points. No pathetically obvious industry-led conspiracy leaps from that material where skeptic climate scientists were paid to manufacture doubt about the certainty of cataclysmic man-caused global warming. Instead, industry leaders were logically collecting already available information about science-based climate assessments as rebuttal against what seemed to be unopposed and scientifically questionable material coming from people like then-Senator Al Gore. Such rebuttal material was probably viewed as potentially fatal for enviro-activists, and from all I’ve found, it appears they took a practically unknown pilot project PR campaign from the Western Fuels Association and blew it out of all proportion in order to have some kind of plausible-sounding ‘evidence’ for their claim that skeptic climate scientists were no different than the paid shill experts who claimed cigarette smoking was not especially harmful. 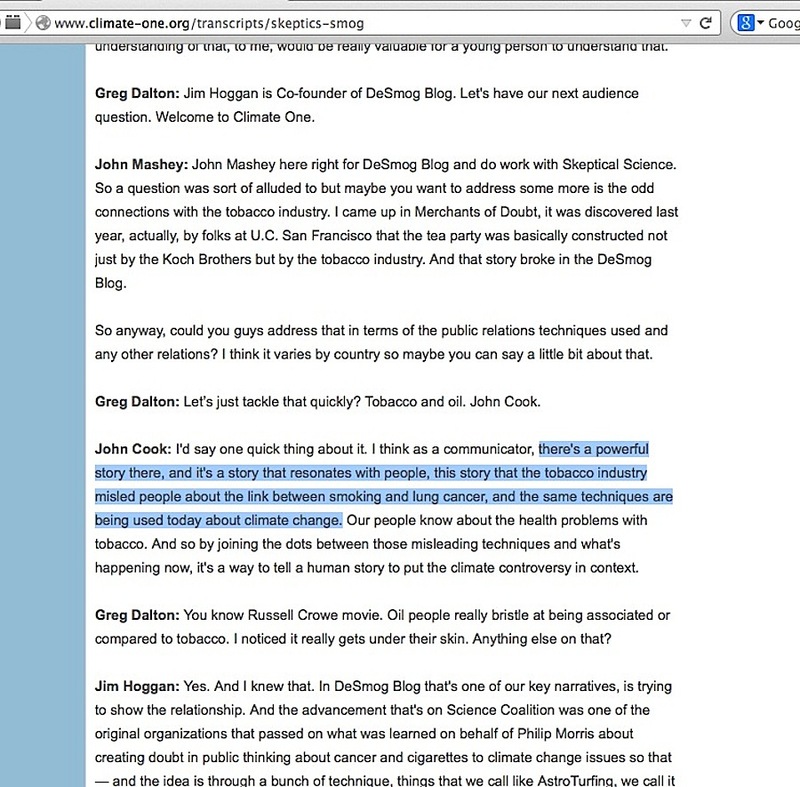 … there’s a powerful story there, and it’s a story that resonates with people, this story that the tobacco industry misled people about the link between smoking and lung cancer, and the same techniques are being used today about climate change. A story that implodes with people when there is no evidence to prove such a parallel exists. 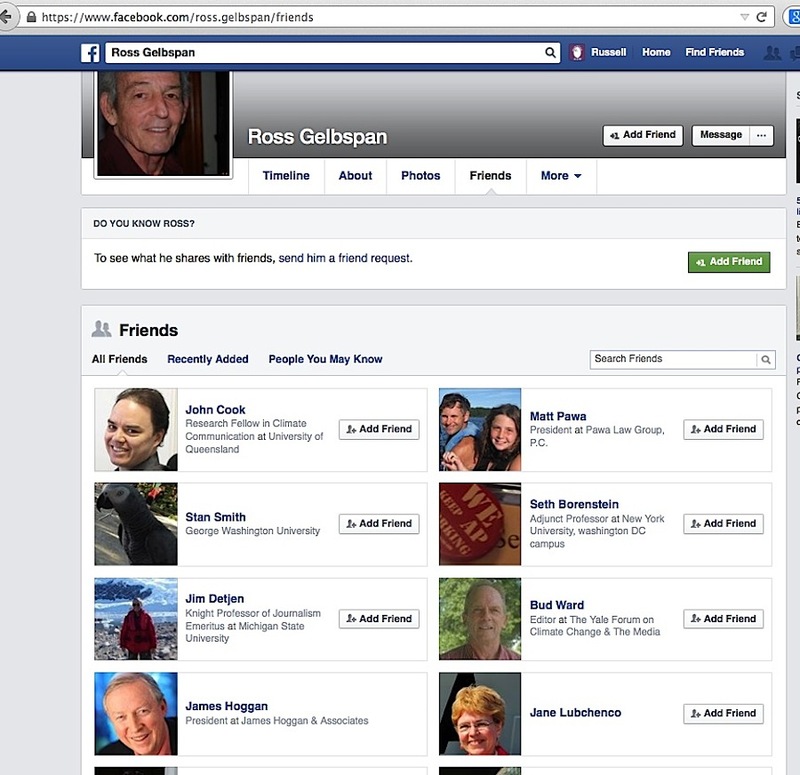 Surprise, surprise, all three Climate One panel members are Facebook Friends with Gelbspan, James Hoggan, Bud Ward and John Cook. 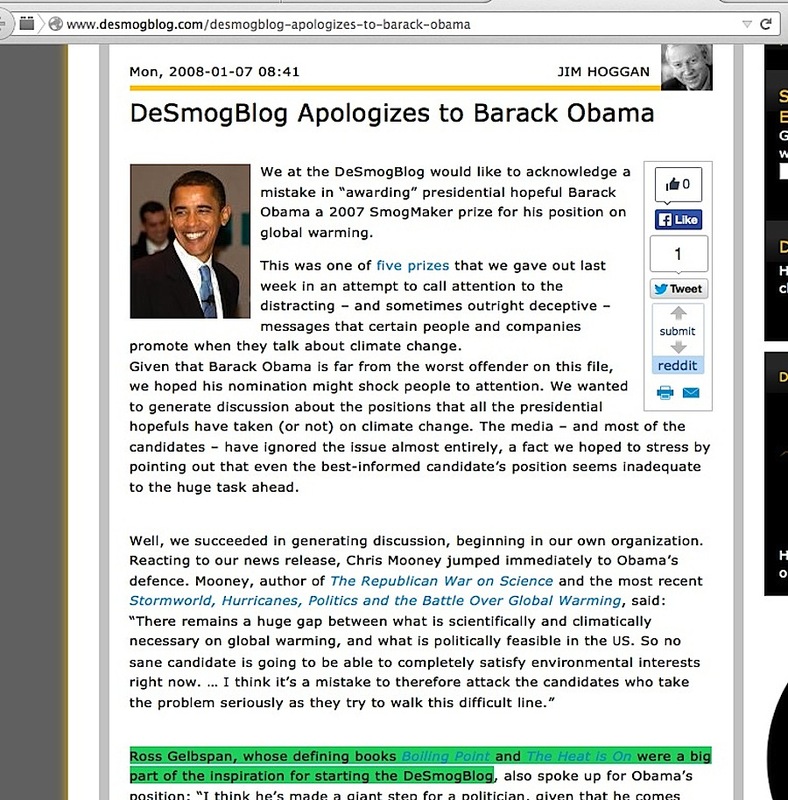 This entry was posted in Citation Cascade, Desmogblog, James Hoggan, Three degrees of Separation or Less, Tobacco Industry Parallel and tagged Naomi Oreskes by Russell Cook. Bookmark the permalink.